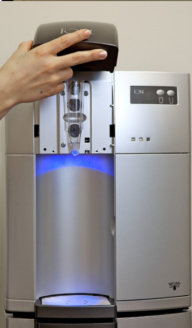 The ION™ is a superior water filtration system and perfect for offices that are looking to go green, save money, and provide their employees and customers with the best drinking water available. The ION™ delivers water one purified glass at a time, better than any other water cooler out there, period. No other cooler, jug or bottleless, keep your water as clean and as cold as the ION™. Not only is the ION™ more eco-friendly than other coolers, it’s also better for your bottom line. From award-winning design to industry-leading technology, the ION™ is the answer to all the problems that you currently experience with other coolers. Forget about clunky jugs, moldy reservoirs, and running out of water before your delivery day. 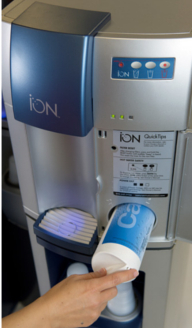 The ION™ delivers water the way it should be, clean, simple, and smart. The average ION™ only needs one filter change per year. 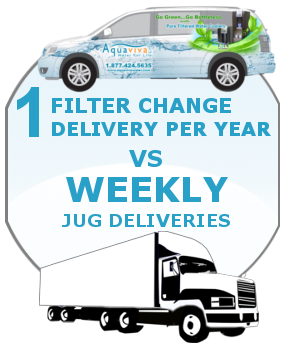 That means that an Aquaviva technician is only making one trip per year to change the filter versus weekly trips made by other water companies to deliver the weekly supply of jugs. 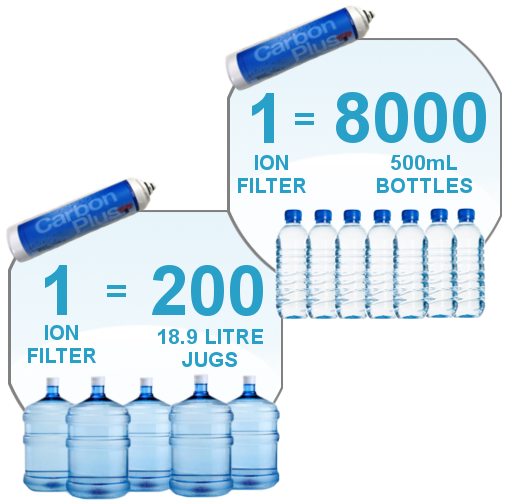 One ION™ filter passes 1,000 gallons of water, or 128,000 ounces before it needs to be replaced. That’s 200 18.9 litre jugs or 8,000 500mL water bottles. Due to the advanced sleep mode, the ION™ saves 4 times as much energy as other coolers without sleep mode. You’re using less, and saving more. Aquaviva carries two different models to meet the specific needs of your office or workplace. All models are equipped with identical technology. There are two different base cabinets that can be provided at no extra charge. 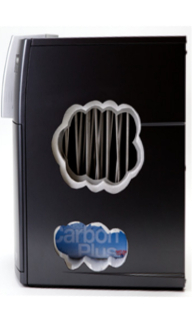 The filter reduces and removes chlorine, taste, odour, cysts – cryptosporidium and giardia and more. One EZ Change filter can purify the equivalent of 8000 16-oz bottles of water or 200 5-gallon jugs. The EZ Change filter is changed when necessary, usually just once a year. That means we’re not only saving on waste by eliminating bottles and jugs, we’re reducing your carbon footprint by eliminating the need for weekly truck deliveries to your office. Conserves energy on evenings and weekends because the ION™ is able to detect when an office is dark. ION™ SleepMode is 30% more efficient than other coolers. Simply put, SleepMode is good for your bottom line, and the environment. The hidden faucet prevents hands and germs from coming into contact with your water. Think of all the people that use your cooler, and the potential for contamination. SaniTouch is another way to keep your water clean and pure. Water enters the ION™ and passes through the filter, travels through airtight coils and pours into your glass without coming into contact with the air. Jugs are contaminated by air as soon as they are in use. 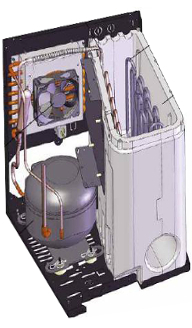 Most jug and bottleless cooler reservoirs need frequent maintenance, and if not cleaned properly are ideal places for algae, mold and/or bacteria to grow. Both types of coolers can be easily contaminated by human touch. The Sealed Water Pathway is the perfect solution to a contamination free environment. Depending on which model you have, water flows through the cold, room temperature, or hot channel. Cold passes through 20 feet of airtight coils surrounded by an ice bank, room temperature flows through the bypass coils, and hot travels into the hot water bank. There is no waiting and no waste. Hot and cold water is ready whenever you want. No reservoir capacity limitation. Using advanced technology, the ION™ continuously monitors the water temperature and filter usage for ultimate quality control. The filter failsafe ensures that water will not be dispensed if there is a detection of contaminants, or will give a warning if the filter is close to its lifetime maximum volume of purification. No other cooler has an advanced water monitoring system like the ION™. When was the last time your office cooler told you it needed a new filter? For your office, there is no cleaner dispenser of cool purified water anywhere and we back that up with cleaner service. Aquaviva Advantage: Due to the revolutionary Sealed Water Pathway and SaniTouch features, the ION™ requires very little maintenance. Other coolers, jug or bottleless have reservoirs that require sanitization every 4-6 months. 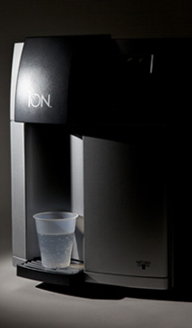 ION™’s water flow is not exposed to air until it starts to fill your glass. But we realize things can happen, life is like that, and if you ever have an issue with your ION™ we react immediately. With our “59 Minute Rule” we instantly log your call and report back to you within 59 minutes to confirm your issue is being tracked from first call to solution. An Aquaviva technician from one of our several locations throughout Southwestern Ontario and the Maritime Provinces will contact you, set-up an appointment, and attend to your issue within 24 hours of the initial call, all of this at no extra cost to you. 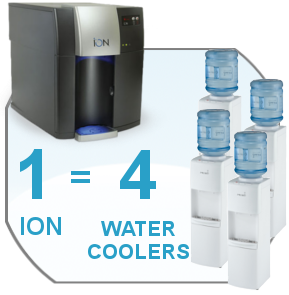 Before we install the ION™, we perform a water analysis to determine which type of filter your office requires. All filters need to be changed, but you don’t need to worry. We monitor the life of your filter and schedule a change ourselves once a year. PureAlert means the ION™ also monitors the life of the filter and if your ION™ reaches 128 000 purified ounces the LED warning lights will indicate that a change is required. So whether Aquaviva calls you, or your ION™ tells you to call us, it’s one simple call and “we’re on it”, it’s really that simple. Aquaviva Advantage: A once a year change eliminates the need for weekly deliveries, meaning less trucks on the road and reduced gas emissions, another example of the eco-friendly benefits of the ION™. The ION™ will save you money, in fact, the ION™ can save you up to 70% over other cooler systems. With a flat monthly fee, your customers and employees can drink as much water as they like because you will never run out. With InstaChill and RapidHot you won’t waste time waiting for it to heat up or cool down. 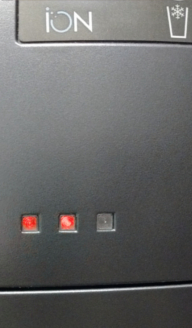 The energy efficient Sleep Mode saves you 30% on electrical usage over other coolers. Aquaviva Advantage: Our business is understanding what you want from a product, what you want from a service provider and we know what that is… keep it clean and keep it simple…now that is smart! 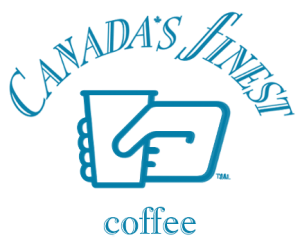 Any information supplied or submitted at aquavivawater.com or our Facebook page, is kept private and confidential and is never sold, reviewed, or used by any party other than Aquaviva Office Water or, if you have inquired about our coffee services, Canada’s Finest Coffee Service, or Maritime Coffee Service. 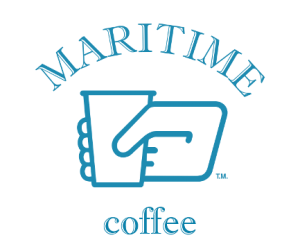 Our sole company purpose is to provide you with the purest water, the best coffee and customer service that goes beyond legendary.